ISIS Claims Responsibility For Attack On Iraqi Embassy In Afghanistan : The Two-Way The Islamic State says its fighters carried out the attack on the embassy compound in Kabul, which began with a bomb explosion at the gates and ended with an hours-long gunbattle. Security forces respond at the site of an attack on the Iraqi Embassy in Kabul. The Islamic State has claimed responsibility. Attackers in the Afghan capital attempted to storm the Iraqi Embassy on Monday, setting off a bomb before gunmen rushed the compound's gate. The Islamic State has claimed responsibility. NPR's Diaa Hadid, reporting from Islamabad, says the attack is likely in retaliation for Iraqi security forces routing ISIS fighters from their stronghold in Mosul, Iraq. "The group is trying to assert itself – through violent attacks – to show its followers that it still has power, despite losing important battles in Iraq and Syria," she says. Conflicting reports said the number of attackers was either three or four. Some reports said the initial blast was from a car bomb, others said one of the attackers, apparently wearing a suicide vest, detonated it, to begin the assault. 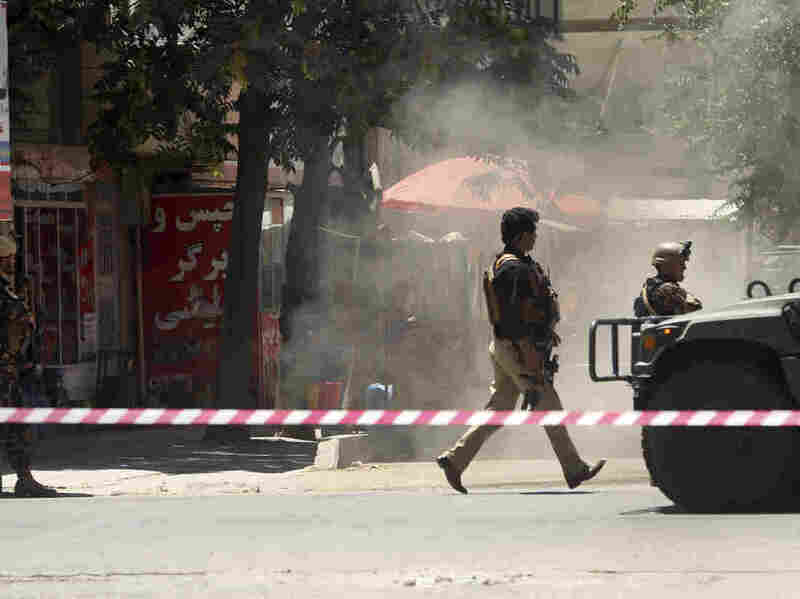 Afghan Interior Ministry spokesman Najib Danish put the number of attackers at three. Witnesses reported several explosions following the initial blast and black smoke rising from the embassy building. The gun battle reportedly lasted four hours. "Our forces are inside and a clearance operation is underway," Danish told The Associated Press, adding that embassy personnel were safe, although embassy guards and nearby civilians might have suffered casualties. The Foreign Ministry in Baghdad says Iraq's charge d'affaires in Afghanistan was rescued from the gunbattle and taken to the Egyptian Embassy. Two other Iraqi staffers were reportedly being evacuated from the building, according to Reuters. The AP quotes one witness, a store owner who goes by the name of Hafizullah, as saying that he saw the bodies of two policemen on the ground before armored personnel carriers and police arrived to cordon off the area.